Angry Birds Star Wars iPhone Game Review. As you all probably know by now, the most popular SF series continues. And although not everybody is confident that Disney is the best choice for continuing the Star Wars series, I bet everybody is excited to see what awaits their favorite characters of all time. But, since we have a couple of years more to see this dream come true, what better way to fill the void than playing one of the most popular games ever created. Especially since the latest release is specially dedicated to Star Wars. Still don't know what I'm talking about? Then just go to the AppStore to download Angry Birds Star Wars and find out for yourself. As if that would need clarifying...Angry Birds Star Wars is exactly what you'd expect to get from the merger of two icons: a beautifully designed game, with the same addictive game play, all combined with a drop of Star Wars magic that makes all the difference when it comes to characters, backgrounds and storyline. Looks like the perfect recipe for success, right? Well, it is! 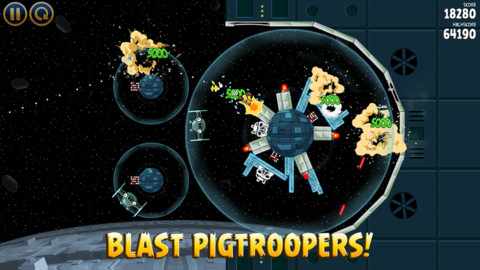 The goal with Angry Birds Star Wars is the same as it was with the first Angry Birds game: kill those wicked pigs. Only that now, pigs represent everything that's evil. They've joined the Dark Side, the wrtched pigtroopers! And your birds are the good guys, of course. And you wouldn't believe how good Luke Skywalker, Princess Leia, Obi-Wan Kenobi, Han Solo, and especially Chewbacca look as angry birds. Plus, even if the game play stays the same, it's only natural for these new, Star Wars inspired characters to have different skills than the original angry birds. 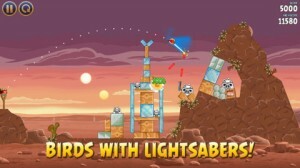 So, of course the Luke Skywalker angry bird has a lightsaber to crush obstacles and reach the pigtroopers. Obi-Wan uses the force. Han Solo is a trained shooter. Chewbacca is the Hulk of Angry Birds Star Wars, having the strength to crush almost everything with its body. And the list of special Star Wars designed skills goes on. And where could the action in Angry Birds Star Wars take place, if not in a galaxy far, far away. It's all about complicated machines, stellar backgrounds, and all sorts of sites that are definitely out of this world. But bare in mind that all these locations weren't created just to make the game look more interesting and make you feel like you're an actual character in the Star Wars series. Since Angry Birds is a pretty strategic game, if you learn how to use the environment to your benefit, the number of birds you get per level are more than enough to destroy all the pigs. So, appreciate the beauty of the background as a whole, but remember to pay attention to details, as well. Now, since we're talking about such amazing icons for the cinema and gaming world, there's always something more to add. But what better way to experience the awesomeness of Angry Birds Star Wars than by actually playing the game? So, enough talking. Grab your iPhone, iPad or iPod, and may the force be with you young Jedi! 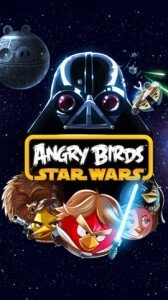 Angry Birds Star Wars is also available on the iPad here. Have this iPhone Game already ? What do you think of Angry Birds Star Wars? Scroll down for our comment section and let us know! Can You Build A Dreamy Wedding Garden?